New Zealand’s most important historical site. 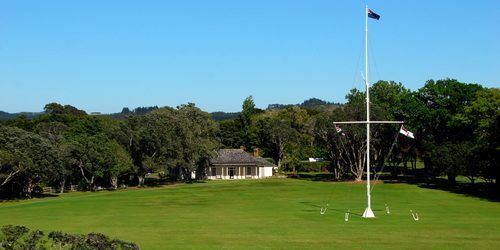 The Waitangi Treaty Grounds is the place where MÄori chiefs first signed their accord with the British Crown in 1840 - the Treaty of Waitangi - Te Tiriti of Waitangi, New Zealand’s founding document. Visit treasures such as the Treaty House, Meeting House, Flagstaff and Ceremonial War Canoe. Situated 2kms from the motel. Journey into a unique part of New Zealand, first discovered by Kupe the voyager. Visit the 2.8 million year old Wairere Boulders and the Waipoua Forest, and meet a national icon, the mighty kauri tree TÄne Mahuta on a full-day tour from Paihia. Enjoy a lunch stop at the picturesque Hokianga harbour. Cycle 85kms through the heartland of the Far North from Opua on the East Coast to Horeke on the West Coast. Bike hire and a shuttle service is available. Contact Jonny to organise your adventure. Located in the Waitangi Endowment Forest, just 6kms from the motel. Scenic trails to cater for all levels of ability, including families. The railway at Kawakawa, 17kms from Paihia, is unique as it is the only working railway in the world where trains travel down the middle of a State Highway and right through the middle of the town. Gabriel built in 1927 is a working steam engine and the only one in her class left in the world. Enjoy a ride through scenic countryside for a unique experience and a great family day out. Choose from a variety of courses within an hour’s drive. From the local Waitangi golf club overlooking the Bay of Islands which is just a 5 minute drive from the motel, to the world class Kauri Cliffs currently rated #39 in the world. A full fun-filled day for the whole family! Unique action games seen nowhere else in the world featuring Flying Trapeze, Circus High Wire, Climbing Wall - all without a safety harness! There is also a 12m high inflatable slide, a 30m water slide, Mini Golf, picnic/BBQ area and much, much more! Take the plunge for an exhilarating way to view the Bay of Islands. Haruru means ‘big noise’ and the water falls in an unusual horseshoe shape. Maori legend says that a Taniwha (water monster) lives in the lagoon below Haruru Falls. You can drive there but there’s an excellent walking track between the Falls and the Waitangi Treaty Grounds, part of it a raised boardwalk over mangroves. A unique off-the-tourist-trail experience that takes you to some of the Bay's very best boutique producers. Visit the farm shop and taste this delectable cheese of Northland. Russell, New Zealand’s first capital, is a quaint village and rich in history. Once home to whalers and missionaries, the town’s original street plan and names from 1843 are still intact and feature some of New Zealand’s oldest and most significant historic buildings. Take a 15 minute passenger ferry from Paihia Wharf across to Russell. Alternatively take the car ferry from Opua. 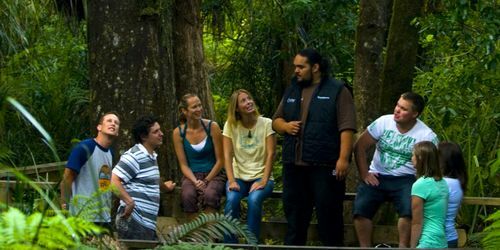 Venture to Northlands rugged West Coast and let the descendants of Kupe, New Zealand’s first discoverer, take you on a night guided walk to the two largest kauri trees in the world. Uncover the beauty of Puketi Rain Forest. See some of New Zealand’s largest kauri trees and rarest insects and birds who have made their home in Puketi Forest. Shop in the country’s oldest store – the Stone Store open since 1835. Walk the original floors of Kemp House, New Zealand’s oldest house. Discover heritage gardens and riverbank walks. New Zealand’s first farm, introducing Maori to European agriculture. It's also where the first oak tree was planted in New Zealand, and marks the destination of the first road built here too - running from Kerikeri to Te Waimate. Te Waimate Mission House was built in 1932. 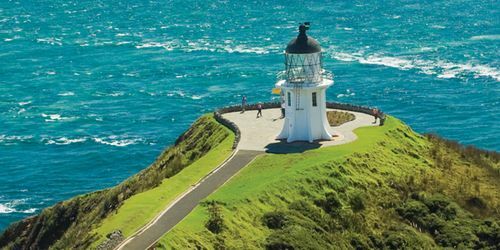 Whether you are interested in a tramp to Cape Brett or a short walk along the coastline, the Bay of Islands area features a number of great walks and tracks all fitness levels and ages. Ride through the forest while enjoying beautiful farmland and ocean views.